We test a replica, which prototype we saw at the IWA 2017. 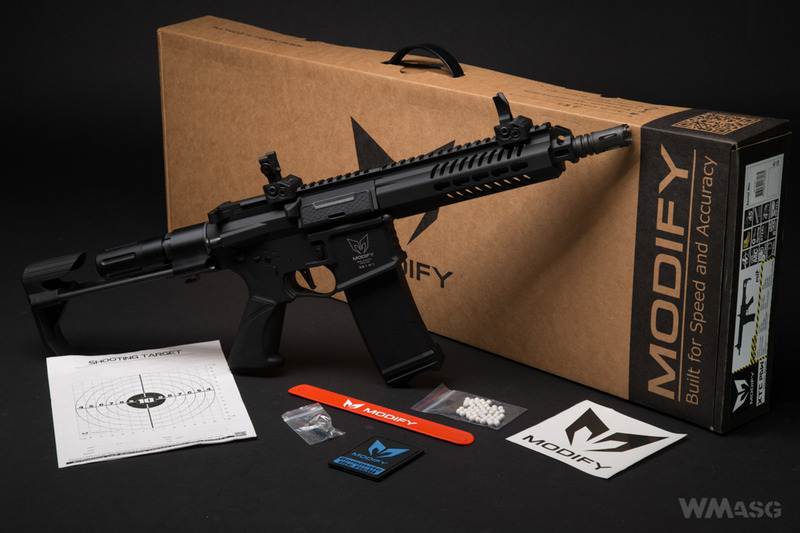 The XTC (eXtreme Tactical Carbine) family of carbines by Modify has just expanded by a third replica - the XTC PDW carbine. Models differ mainly in the length of the barrel and the front. 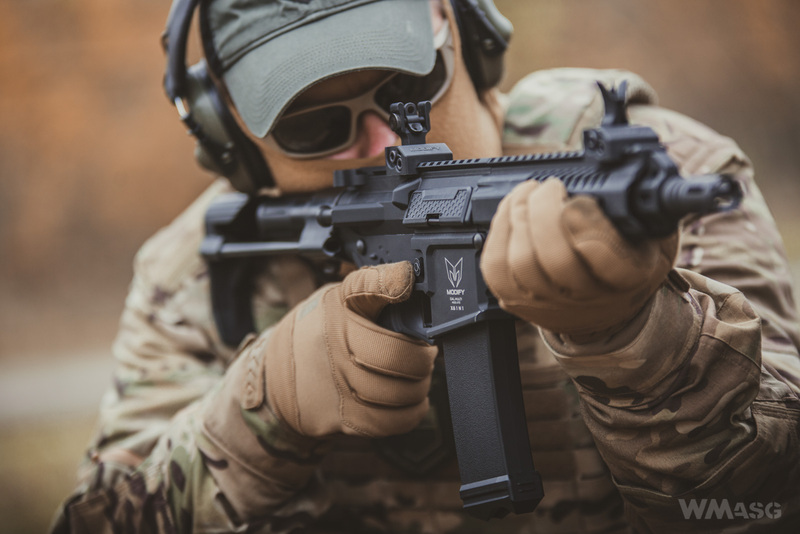 The XTC PDW also has a characteristic stock modeled after the PDW type stock amounted on the HK416C with an extended buttplate. – a sticker, a Velcro patch, a wristband and paper targets. 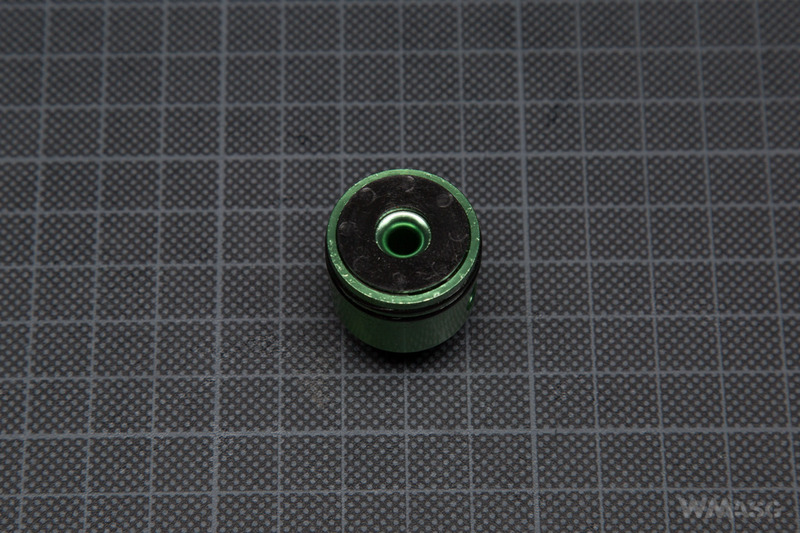 – inner barrel diameter 6,1 mm. 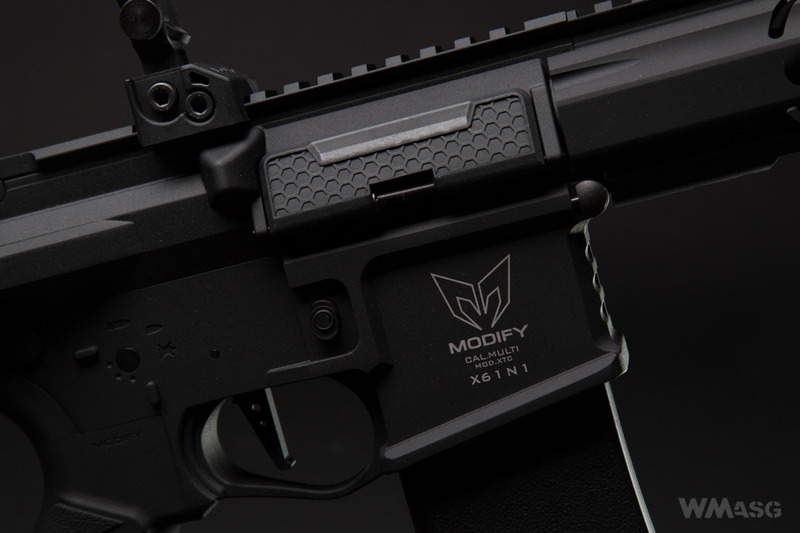 Muzzle velocity specified by the manufacturer is 270 fps (+/- 10). As you can see, a robust packaging is made of cardboard and performs its protective function without any problems. Individual parts of the set are placed in sockets cut in many layers of cardboard. When taken in one's hands, the replica makes an excellent impression. It does not have the slightest slack of any parts, it fits perfectly in one's hands and is very handy. Most parts are covered with black matte paint with a fine texture. Unfortunately, in practice the coating turns out to be less resistant to mechanical wear. The first scratches on the edges appear very quickly. According to the information provided by the manufacturer, the basic construction material of the replica is aluminum. 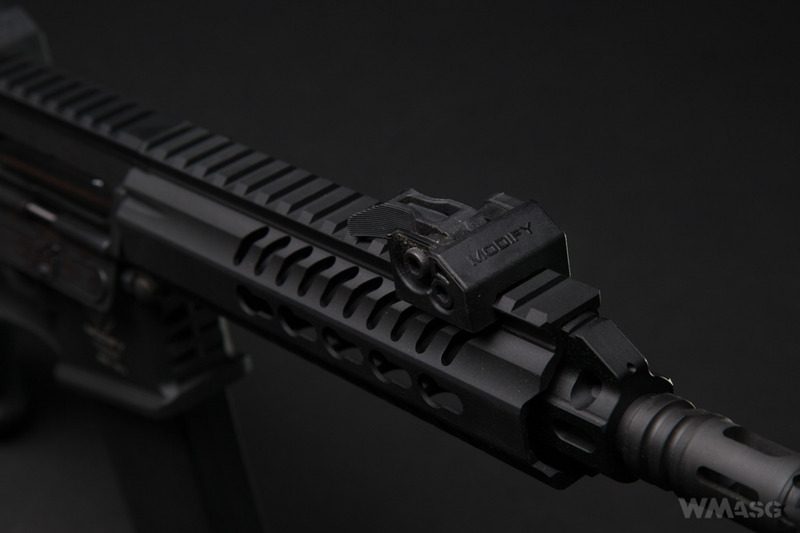 This material was used to make the upper and lower receiver, a front grip, which uses the Keymod system, an external barrel, some parts of the stock and manipulators. The steel parts are the trigger, the flash hider and the stock guides. In information materials, the receiver is referred to as "billet style", meaning in the style of ones milled from a piece of rolled aluminum. The key word is probably the word "style" - I couldn't find any information that the replicas receiver is milled. 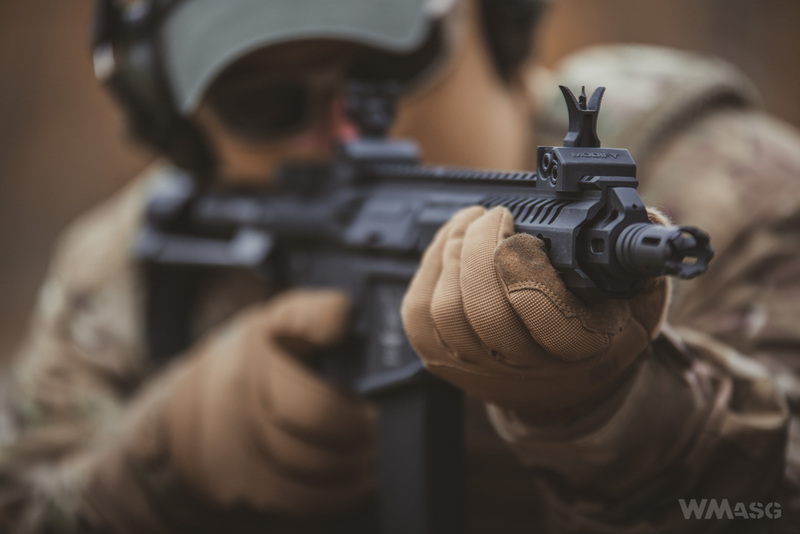 The ejector port cover, opened by pulling the charging handle, is very interesting. It is made of polymer and has a honeycomb texture. After opening the cover, while adjusting the Hop-Up chamber, you can lock the dummy bolt in the rear position. 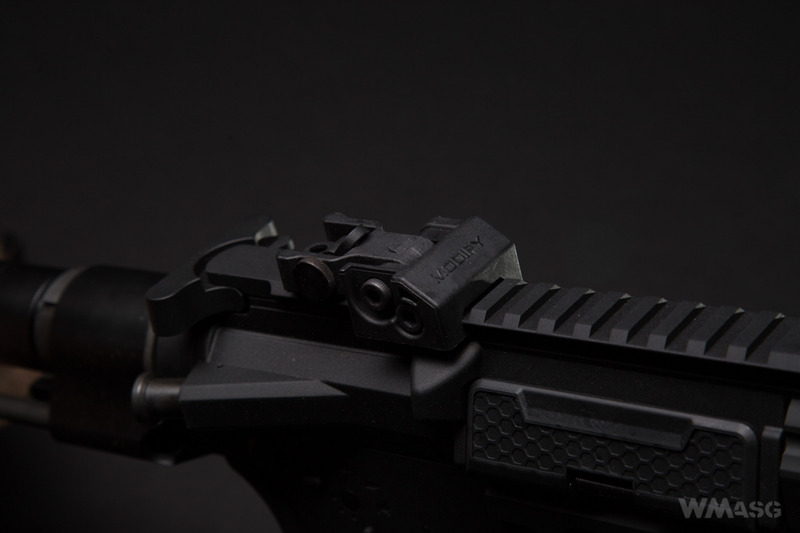 Folding sights are made of plastic and manually lifted into working position. Unfortunately, they will not lock in this setting in any way and you have to consider the fact that they will fold when in contact with the webbing. 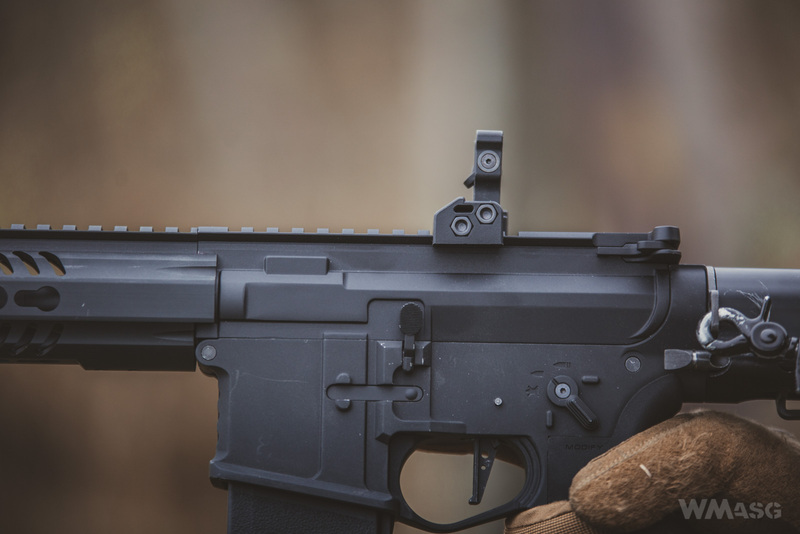 The front sight is vertically and the rear sight is horizontally adjustable. The sight's aperture has two settings - unfortunately, they move very freely and also do not lock in working positions. 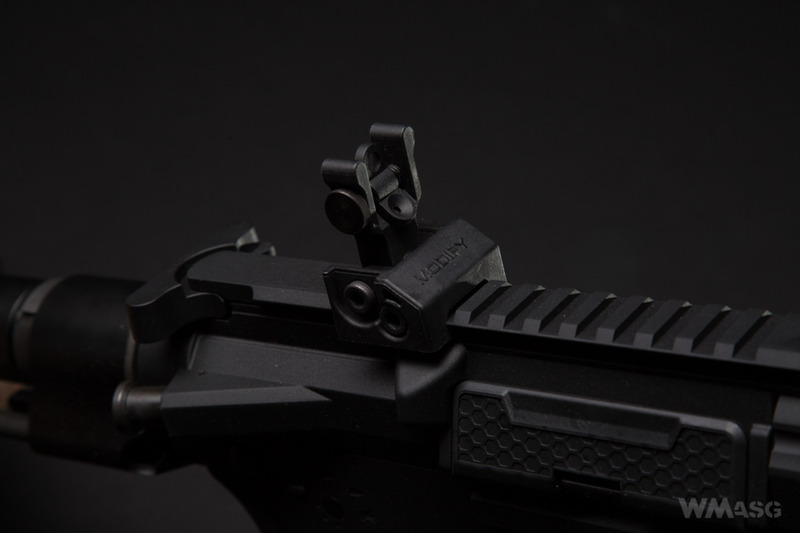 As you can see in the photos, the sights are mounted on a Picatinny rail. 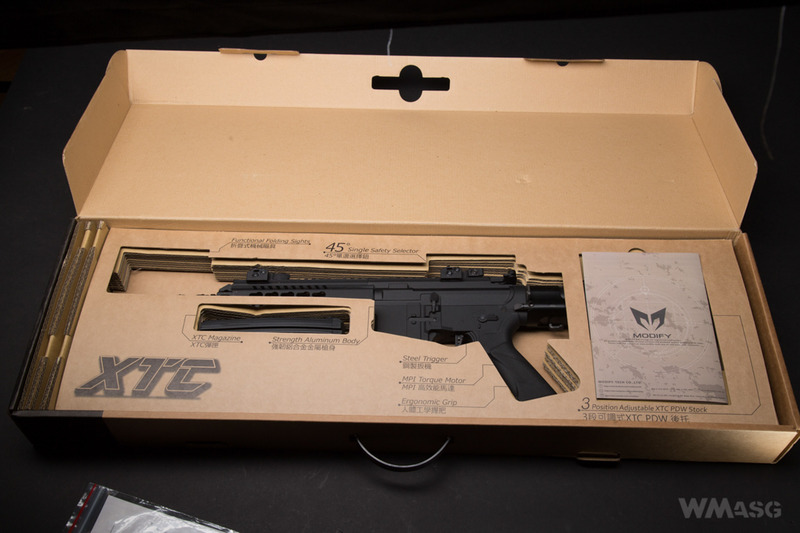 The replica is equipped with a 7-inch front using a the Keymod system. The front is made of CNC machined aluminum. There are 5 mounting sockets on the sides and bottom. 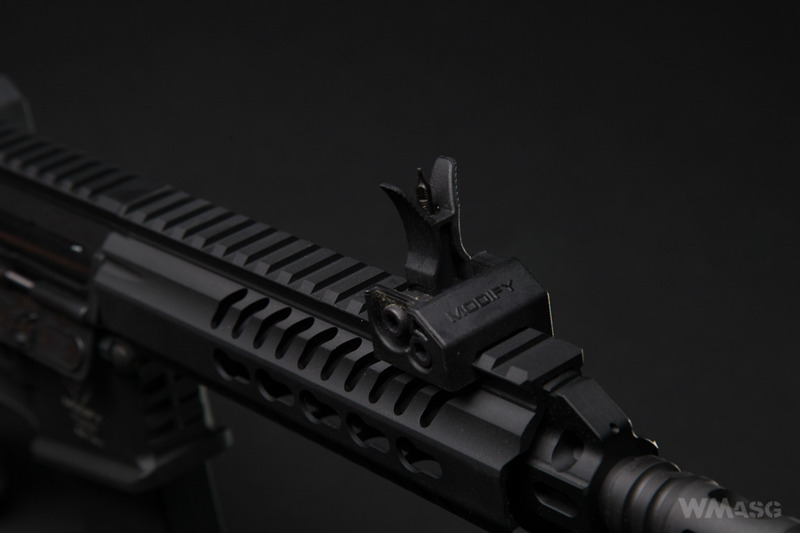 At the top, the Picatinny accessory rail is almost perfectly aligned with the height of the upper receiver. The front is mounted using two screws. The stability of the mounting is exemplary. Under the front the dummy gas block and tube are mounted on a CNC machined external barrel. 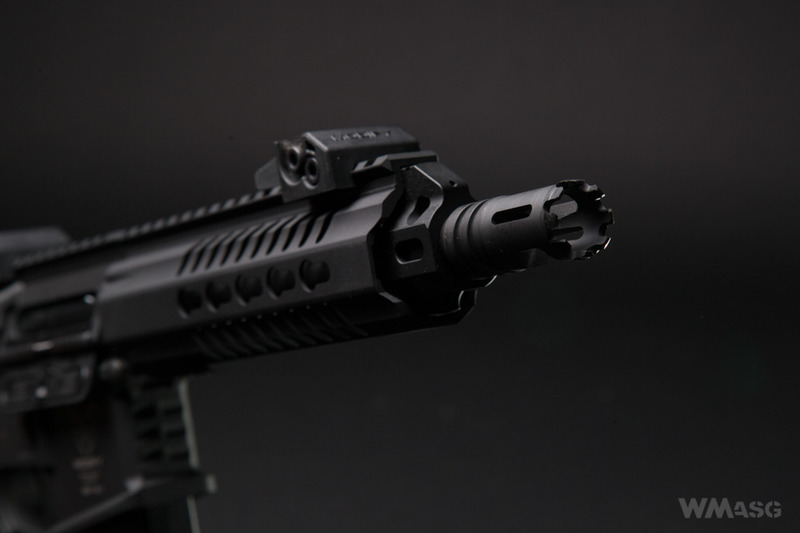 The barrel end with steel flash hider with a counterclockwise 14 mm thread. The fire selector switch located only on the left side of the receiver works in the range from 0 to 90 degrees and not the usual 180 degrees. To set it on single fire one has to turn the switch by 45 degrees. Turning it by 90 degrees sets the replica to the full-auto mode. 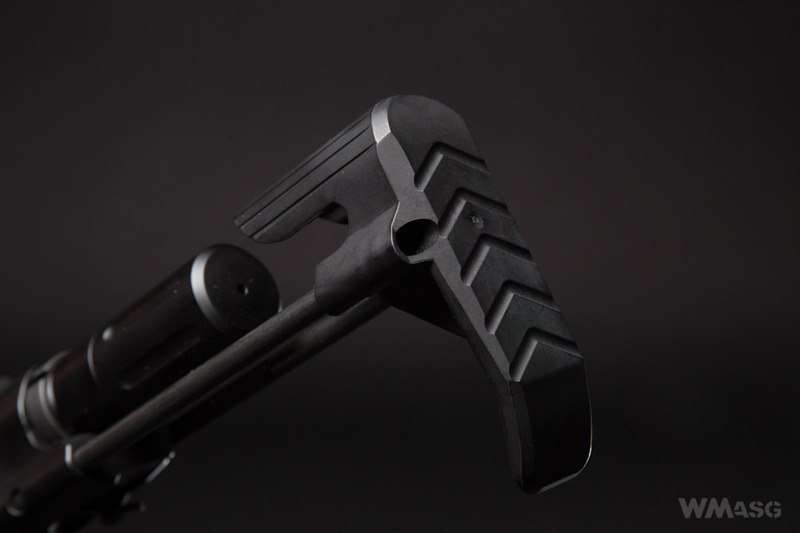 The pistol grip seems to be narrower than the standard ones, but that's just an impression. 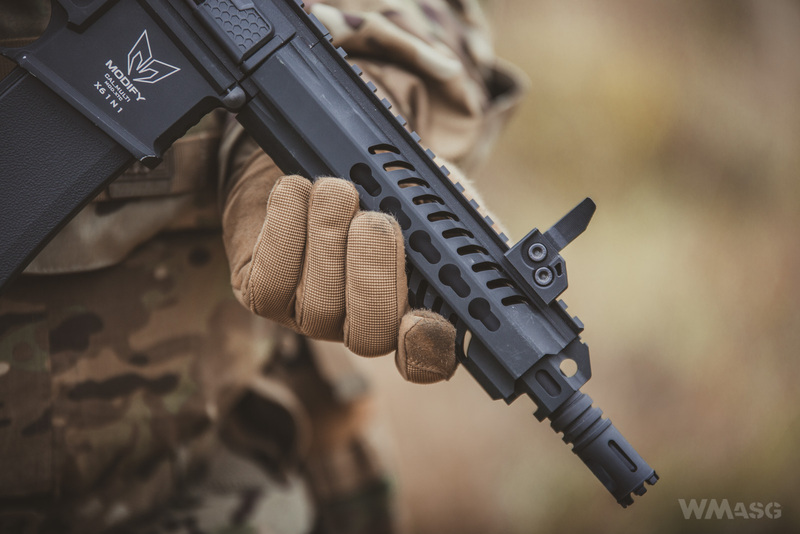 It does not have a ribbing separating the fingers, and in the rear it smoothly overlaps the lower receiver of the carbine. The side surfaces have a texture for easy handling. 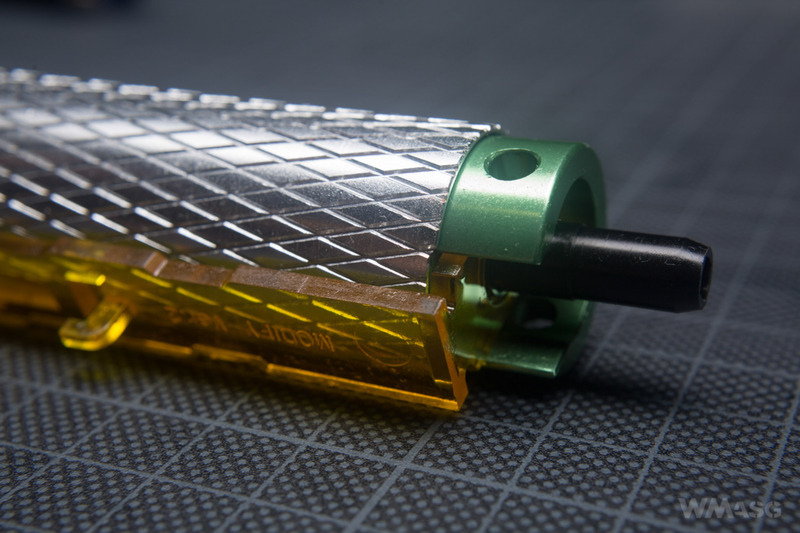 Inside the grip has glued brass threaded bushings for the cap screwes and a cleverly designed space to guide the wires. The floor plate is rubbed and thus half opened. The spacing washer was not used for the motor. The assembly and adjustment of the motor is done by bolts using an allen wrench. 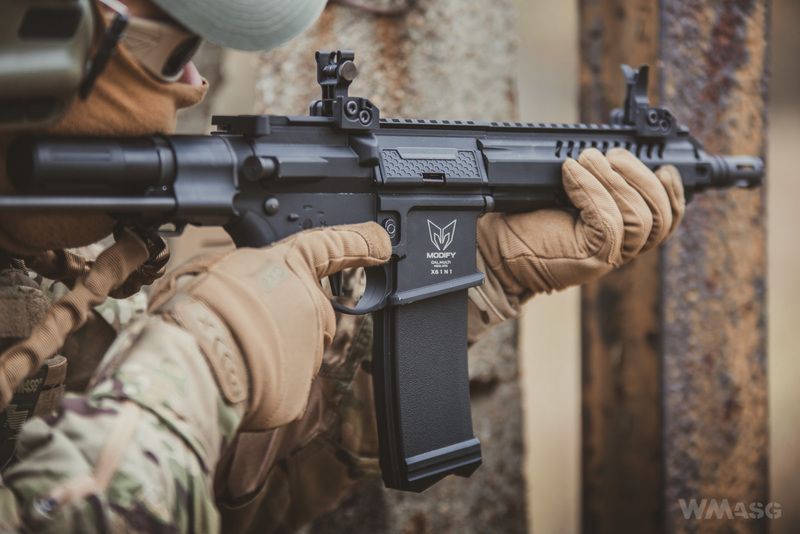 The stock is in the HK416C style and is made entirely of metal, the guides are made of steel and the remaining parts are made of aluminum. 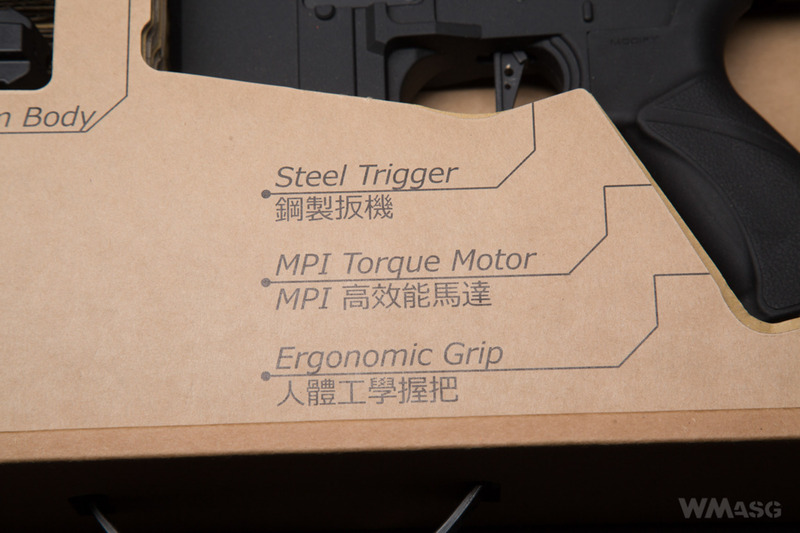 The extended stock buttplate is made of polymer. The length of the stock can be adjusted in 4 positions. After moving further, the right guide, which is shorter, slides out of the slot and allows one to twist the stock. This makes it easy to access the battery space. 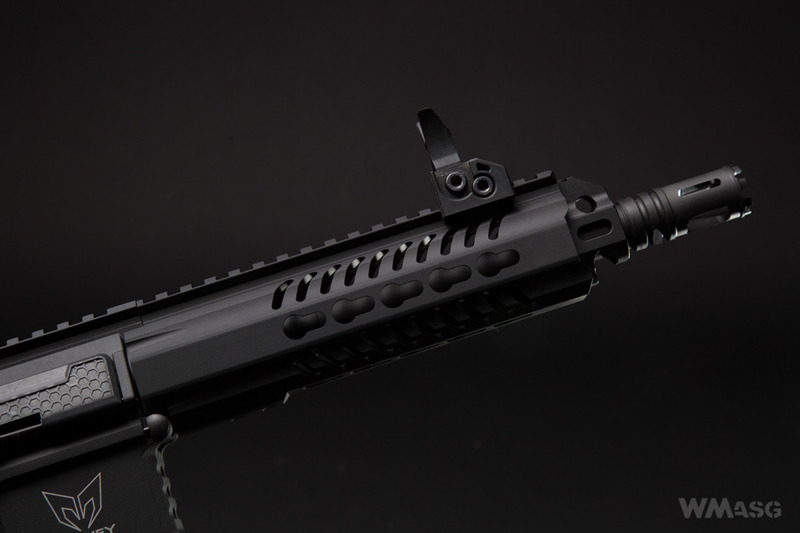 The left guide is secured against sliding out the stock, which prevents accidental disconnection of it from the carbine. The place for the battery is provided inside the tube. It is very small. The tube's inner diameter is 25 mm and the length is 125 mm. This space has to house a battery, a T-plug and a mini fuse. 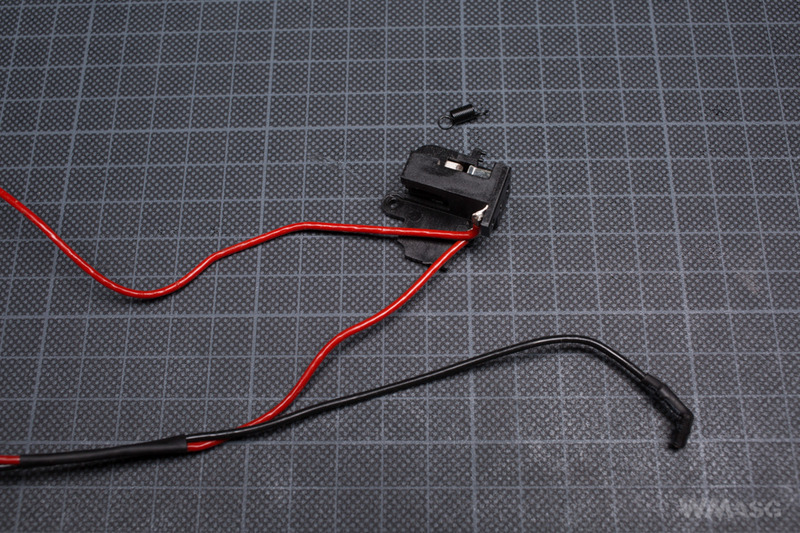 The LiPo 11.1 V 1400 mAh battery we used for our test did not fit. At the bottom of the tube has a 4 mm Allen key socket. 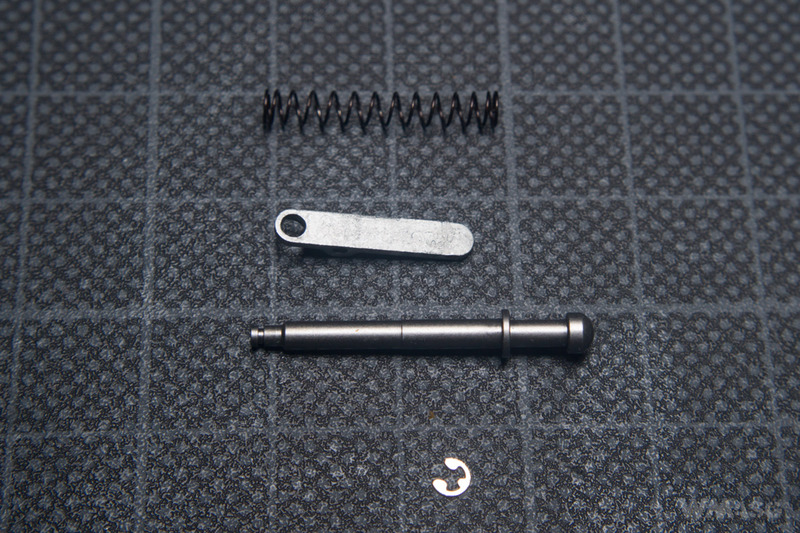 A slight counterclockwise movement allows the main spring and guide to be pulled out. 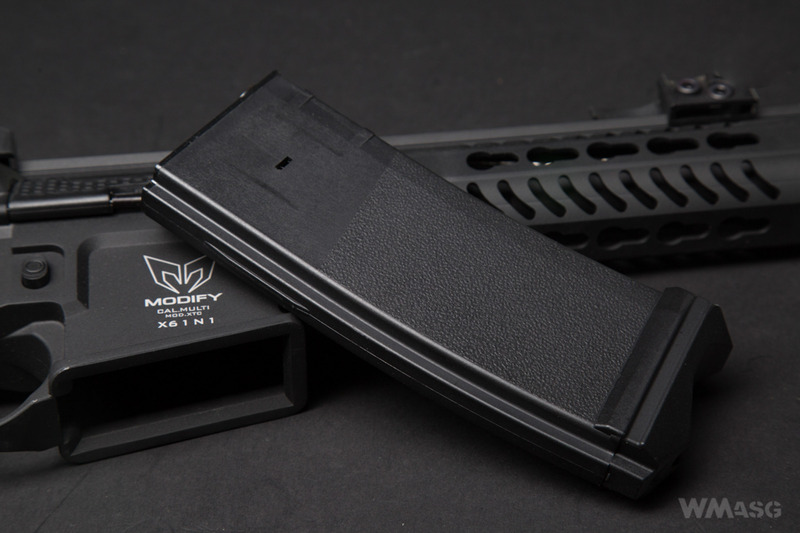 The 190BB mid-cap magazine is made of polymer. 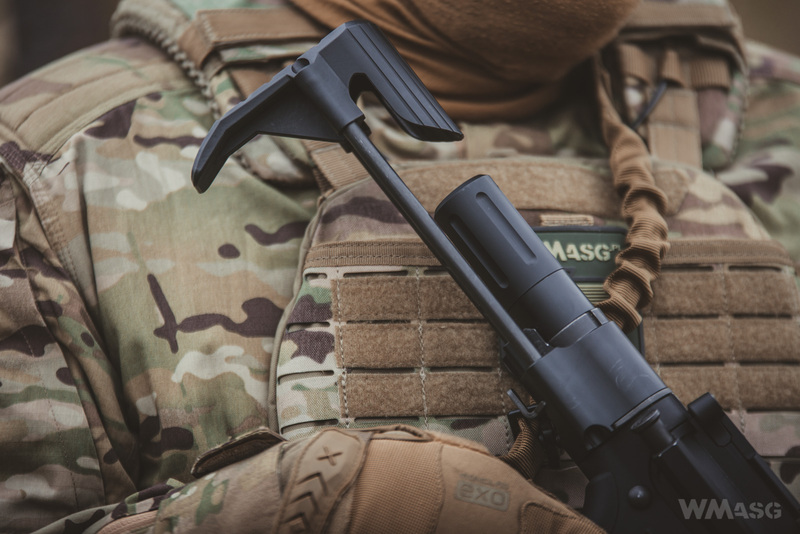 It fits into the magwell with minimal slack. Taking the upper receiver of is not difficult. 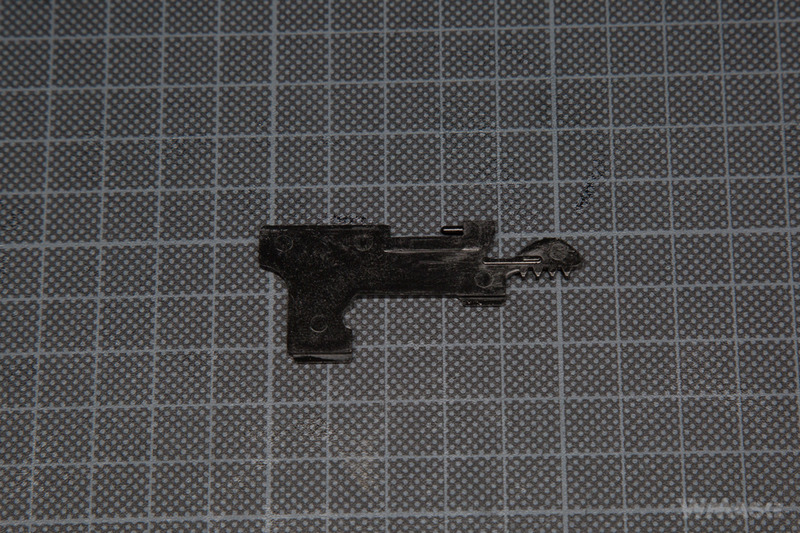 As in many other replicas, the front pin connecting both parts of the body should be taken out and the upper receiver should be pulled forward. 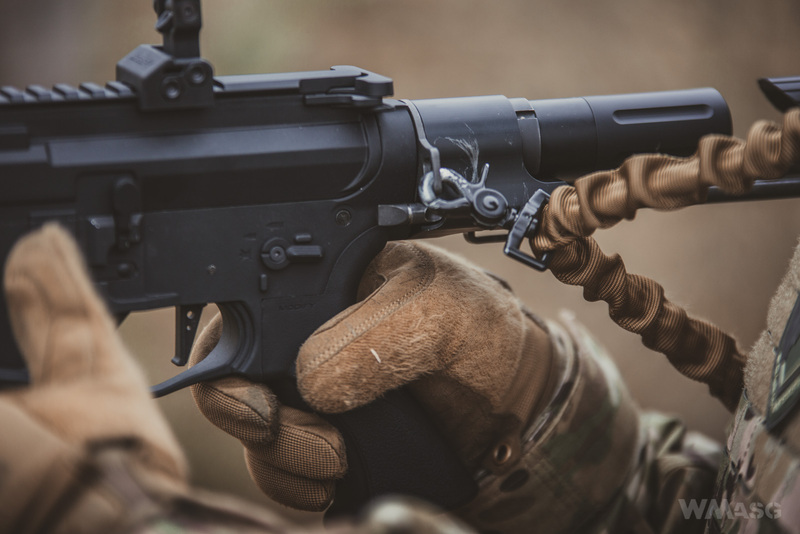 The charging handle is connected by a spring with the gearbox - we only pull out the upper receiver itself together with the front and the barrels (external and inner). 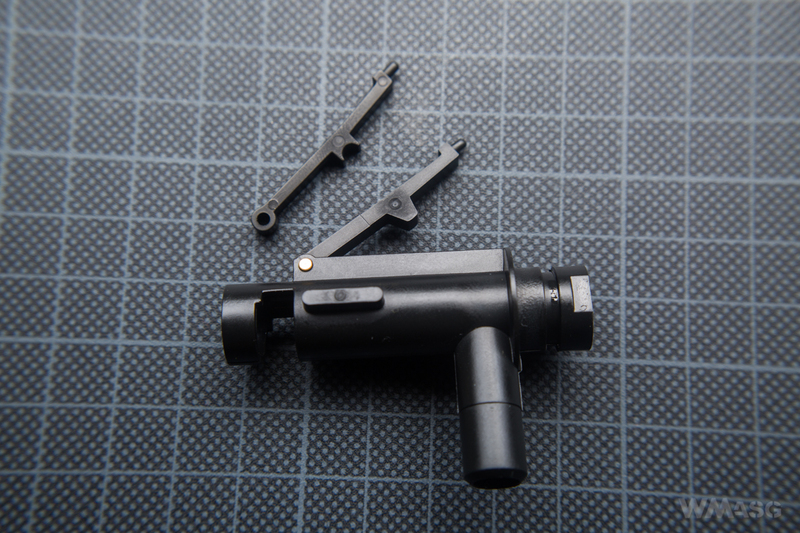 Removing the gearbox from the lower receiver is more complicated and proceeds differently than in most AR-15 replicas. First of all, if we haven't taken the spring and the guide out, it's time to do it now. Without this, we will not be able to remove the gearbox, because the socket of the spring guide is in the tube which is screwed into the lower receiver - with the spring in place moving the gearbox is impossible. After removing the spring, take out the rear pin, above the pistol grip, and the pin above the trigger. 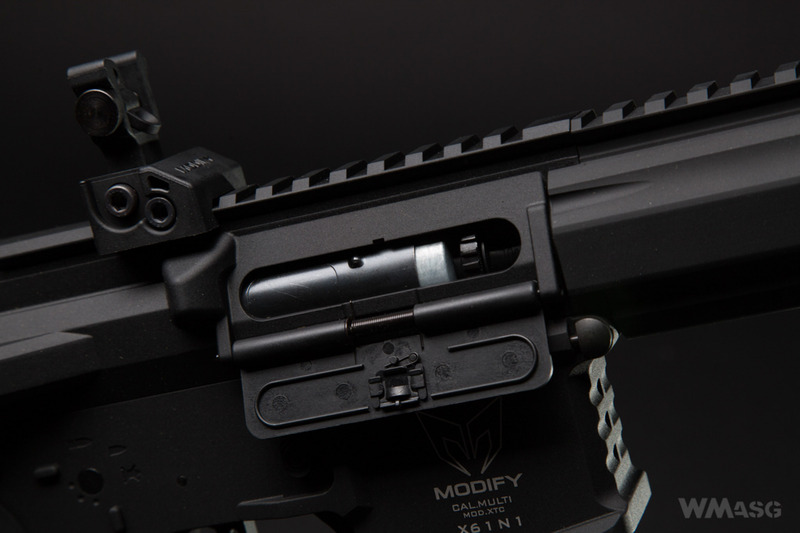 It is worth noting that the pins connecting the two parts of the receiver are protected from falling out and will not be lost. Next we unscrew the screw securing the fire selector switch and remove it, taking care not to loose the spring and the steel ball underneath. 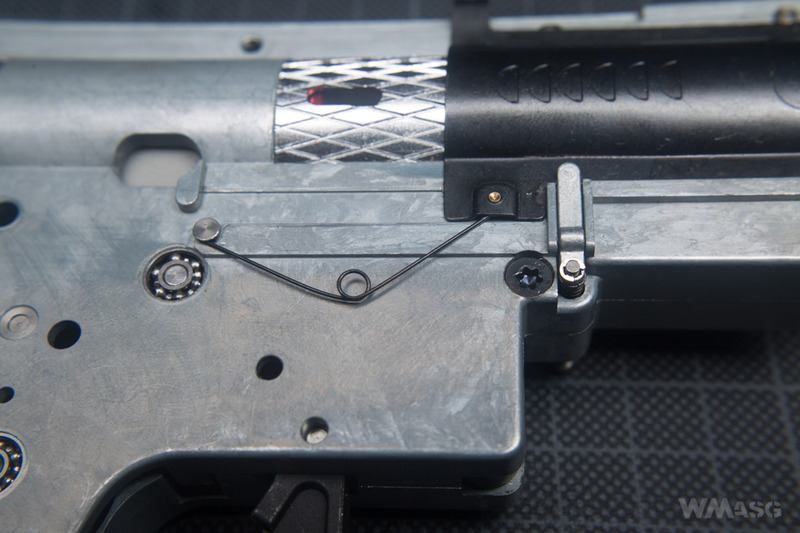 Do not move the magazine latch - unlike most AR-15 replicas it is not connected to the gearbox and you do not have to pull it out. Its design is interesting: the spring is pushed against a Seeger ring, which is accessible from the top only after removing the gearbox from the receiver. After removing the pins we can remove the gearbox. 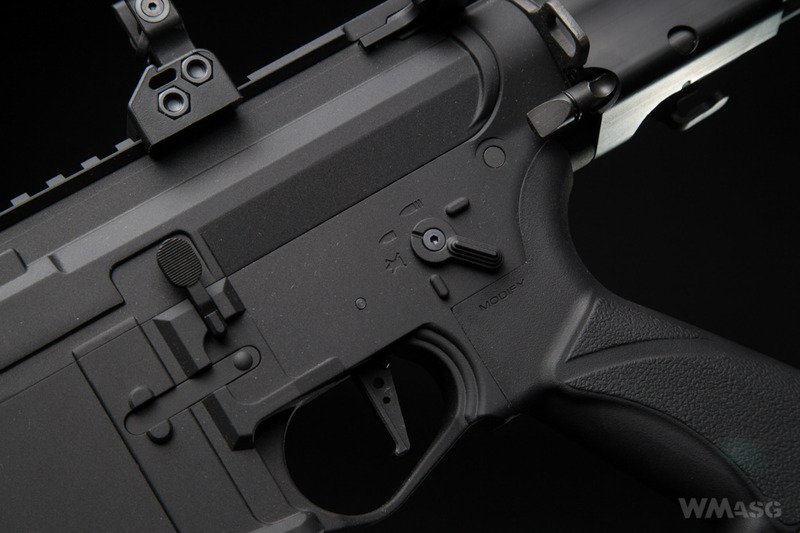 Probably the cam connecting the fire selector switch with the selector plate will also fall out. The wires remain a problem. 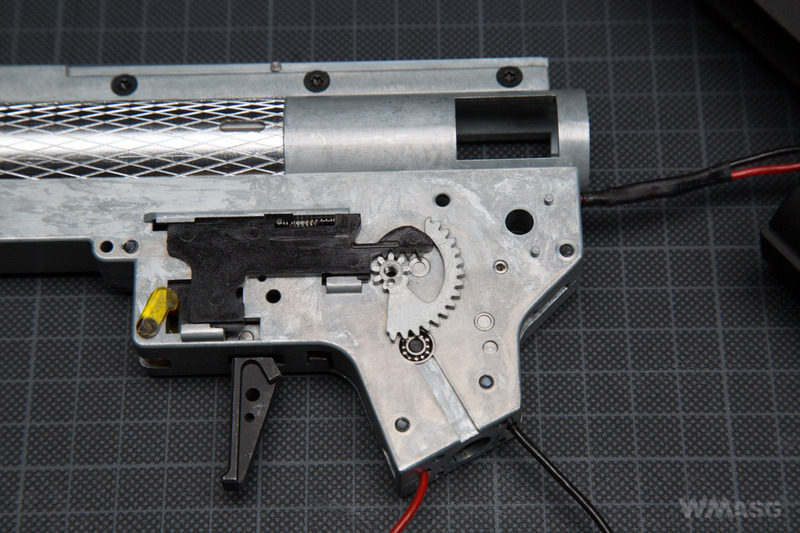 I did not find a sensible and non-invasive way to go with the wires, with the plug attached, through the guide and the back of the carbine's receiver, which made it extremely uncomfortable work with the gearbox. The Hop-Up chamber and the inner barrel. 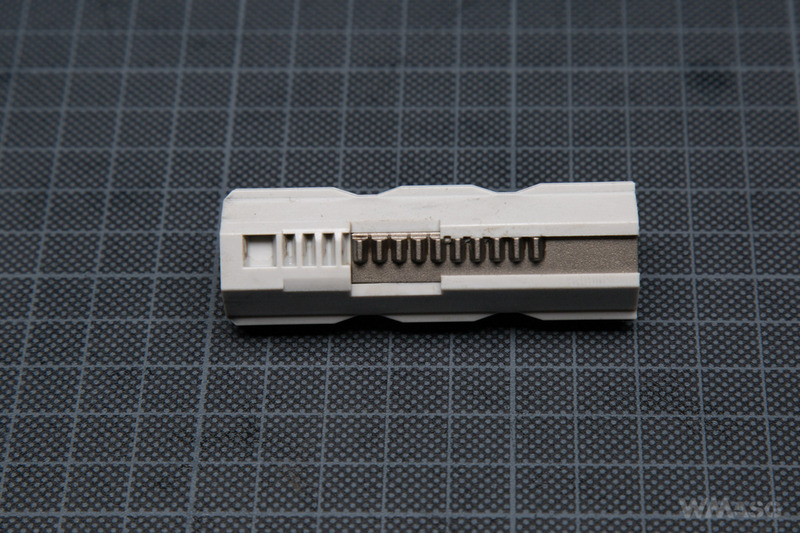 The chamber is made of plastic and has a adjustment knob situated around the barrel's axis. A pressure lever with a rounded nub is factory installed. The set also comes with an additional lever, the shape of which is designed to cooperate with a classic cylindrical spacer. The chamber is pressed against the gearbox with a conical spring situated on the inner barrel (wider side is placed towards the barrel's exit). The HopUp bucking is standard and black. 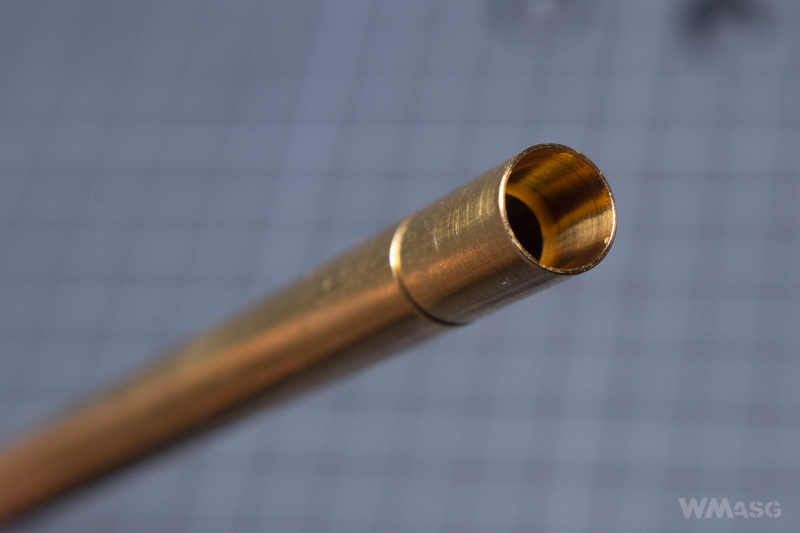 The inner homogeneous (not Hybrid) barrel made of brass. Its inner diameter is 6.1 mm. The HopUp system's pressure lever port is enlarged. At the barrel's exiting end is a small indention in which a rubber o-ring centering the barrel was mounted. The barrel is not beveled at the end. It has a small chamber with a larger diameter to perform a similar function and improve accuracy. The frame is a heavily modified version 2 - not replaceable with a standard one in case of a crack. It's characteristic feature is the back opening at the height of the cylinder - I wrote earlier that the spring with the guide is embedded in the bottom of the tube which is screwed into the lover receiver. In addition, we have an AOE inspection port and an anti-reversal latch unlock port where a small flat screwdriver fill fit. 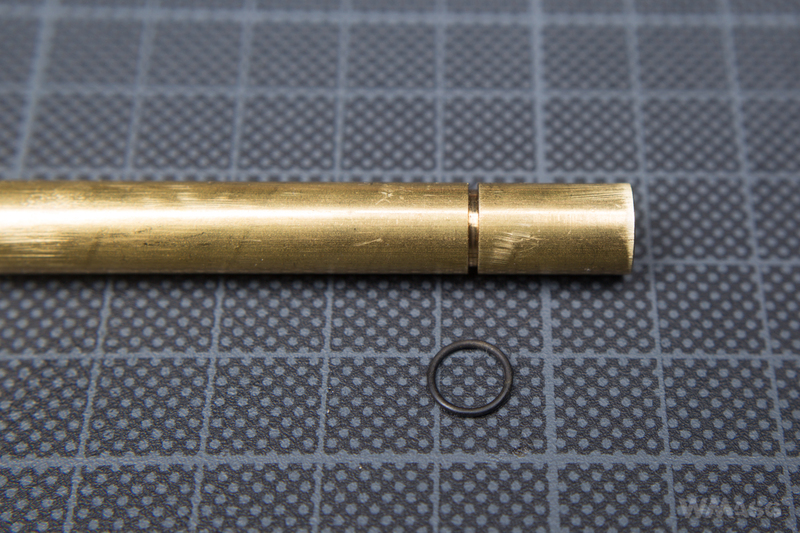 Unlocking the latch makes it easier to set the piston in the front position. 8 mm ball bearings are installed for the bevel and sector gears. 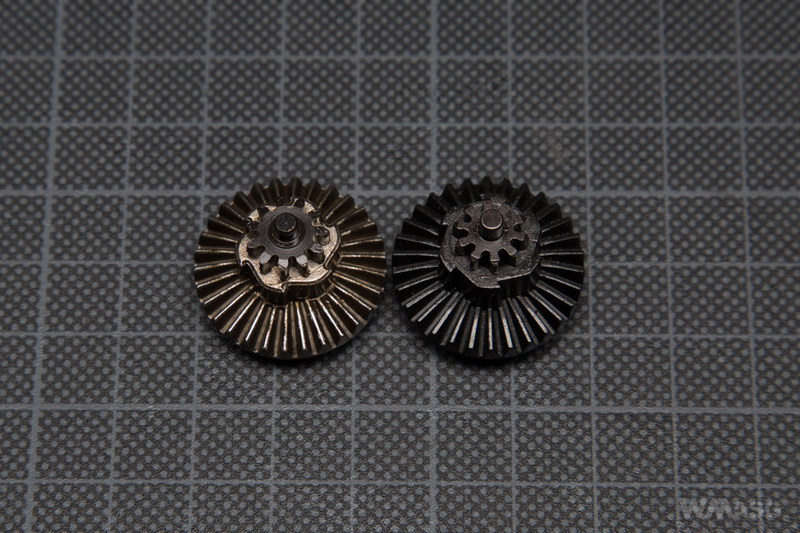 The spur gear is fitted with central bearings rotating inside steel bushings. Going back to the bearings. Contrary to what can be read in several reviews, these are not ceramic bearings, but very good quality industrial grade 5 bearings (the classes are: 1, 3, 5, 7, 9 - the higher the better). The cut-off lever is steel and standard. 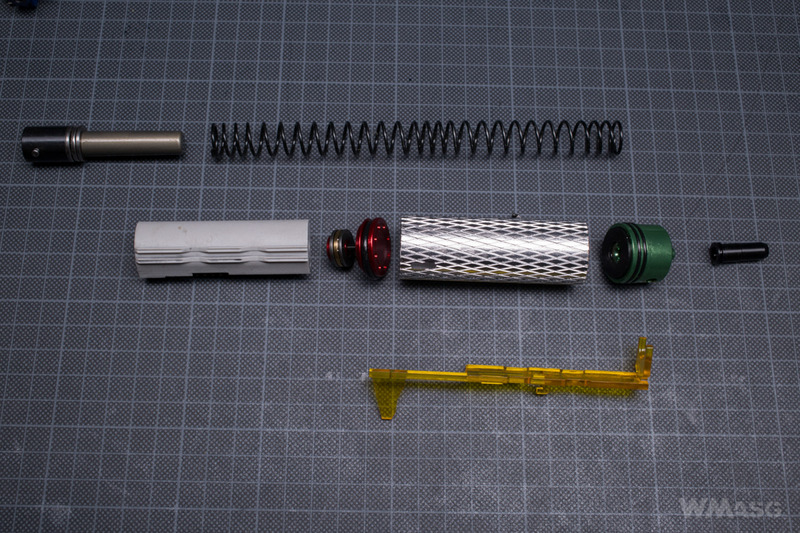 The trigger switch set, the trigger safety lever and all the springs is also a standard. The electric wires are rigid, thin and encased in hard insulation. The trigger and the anti-reversal catch made of steel. The trigger is flat, skeletal and vertical. 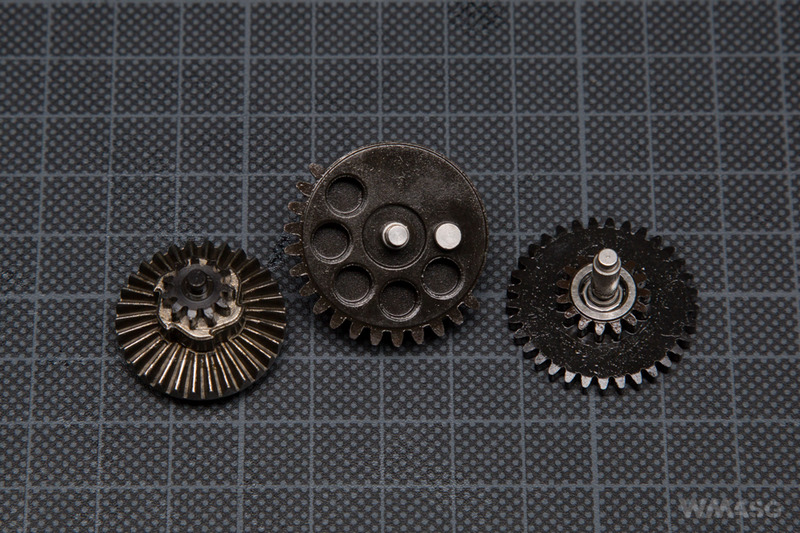 The gears are steel and very precisely made (CNC). Unfortunately, they are non-standard i.e. dedicated to XTC replicas. 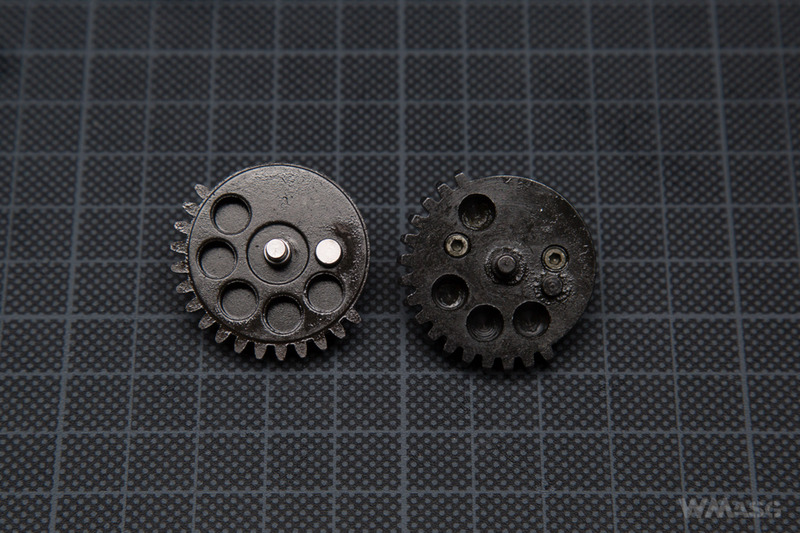 The spur gear has a diameter of 27.72 mm, while the gear has a diameter of 32.67 mm. 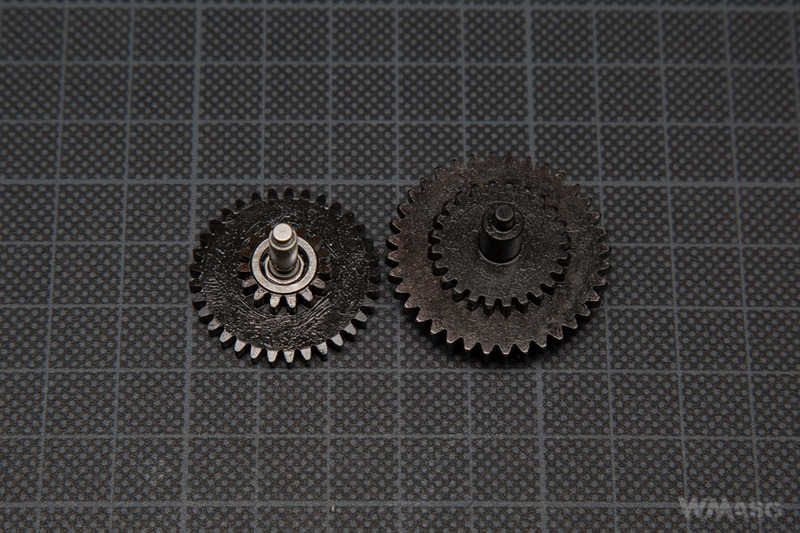 In the photos below we compare the Modify XTC gears with standard ones (by Tornado). Modify gears are always on the left. As I wrote earlier, the spur gear has central bearing. 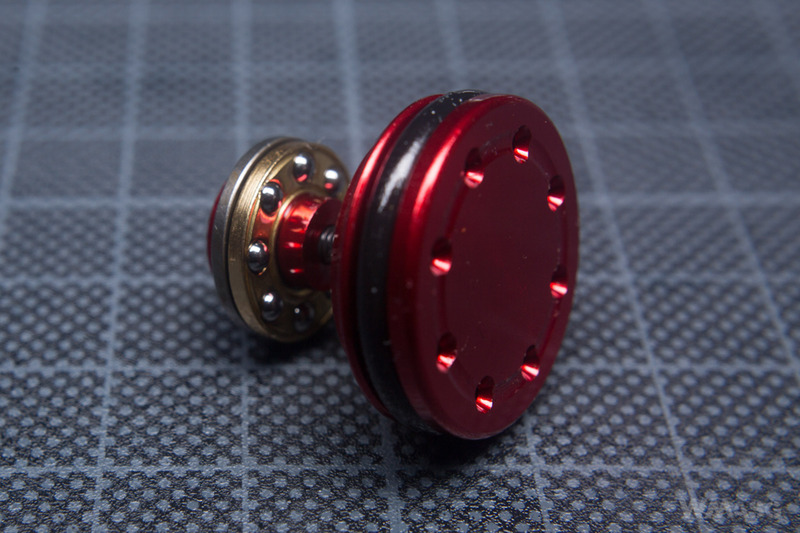 It is designed around 2 independent ball bearings. You can see it better in the photos below. The axis is made of steel and slid into the bearings. The pneumatic system has an aluminum cylinder with a wafer texture, an aluminum cylinder head with two o-rings and a plastic nozzle which also has an o-ring. Despite the barrel's length of only 205 mm, a type 1 cylinder is used. The cylinder head with a flat rubber bumper. 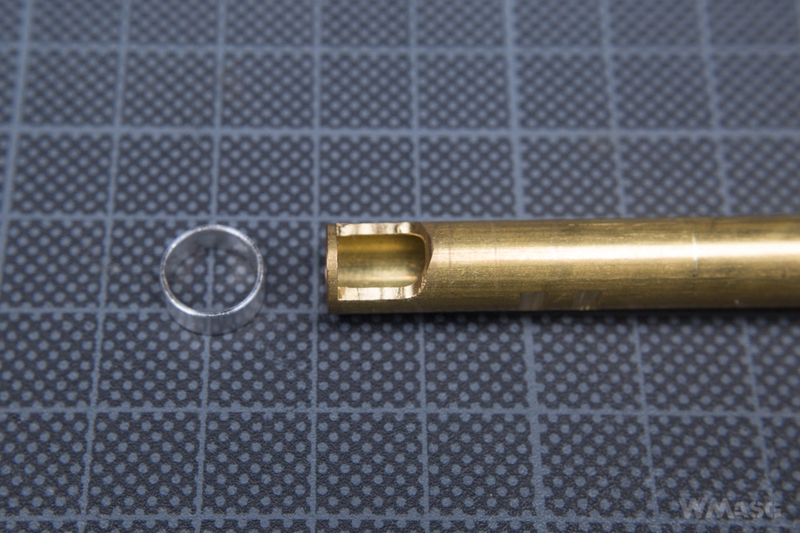 The nozzle's length - 22.15 mm, which is different than in most AR-15 replicas. The piston head is aluminum, flat and with eight holes. It has a full ball bearing. The piston is made of robust looking material, with 10 steel teeth. The penultimate tooth is missing. The tappet plate is standard. The whole system looks extremely robust and provides an above-average air tightness during the "syringe" tests. 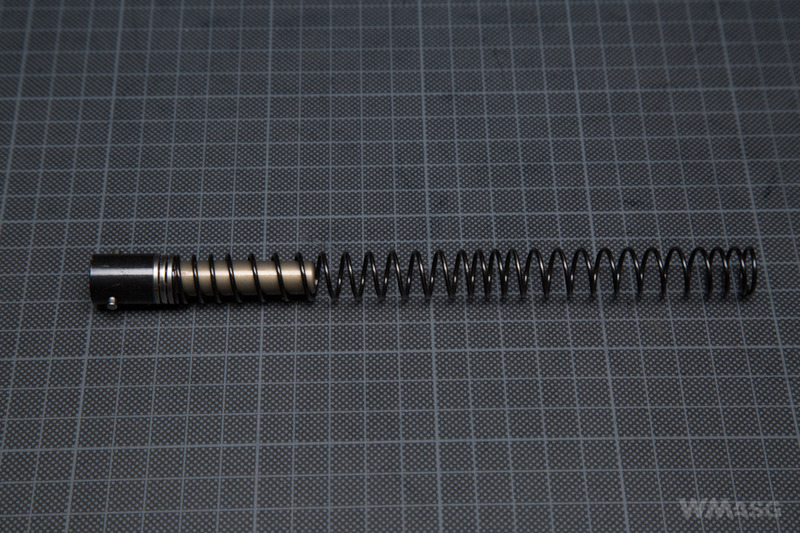 The spring has a linear design. The guide is metal and has a bearing. 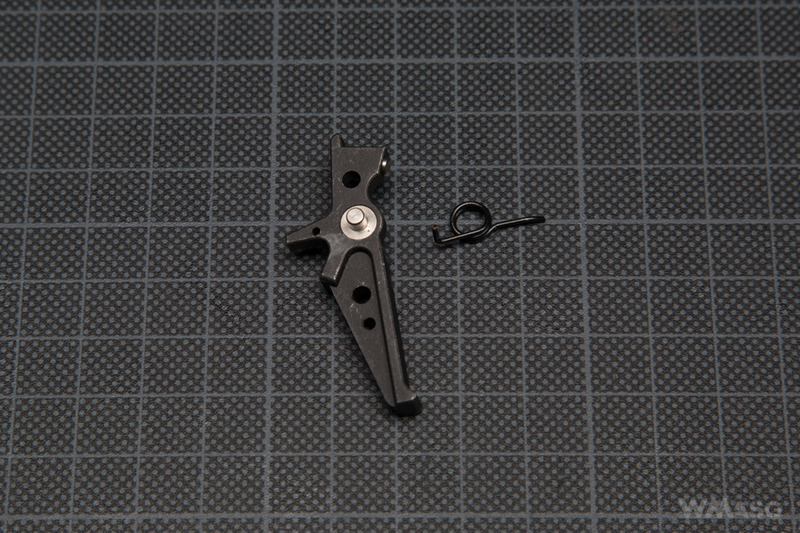 It is designed specifically for the XTC PDW. 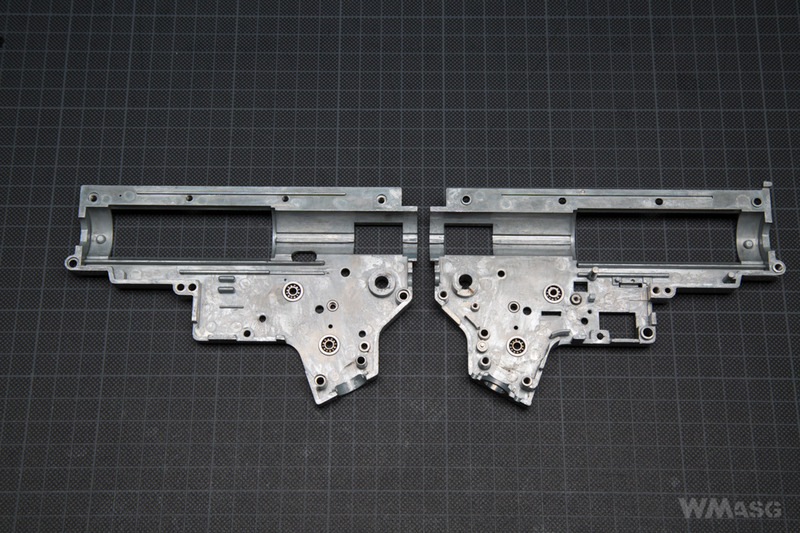 Due to the way the selector switch works, the selector plate has a unique shape. The long type MPI 22T motor marked as torque. 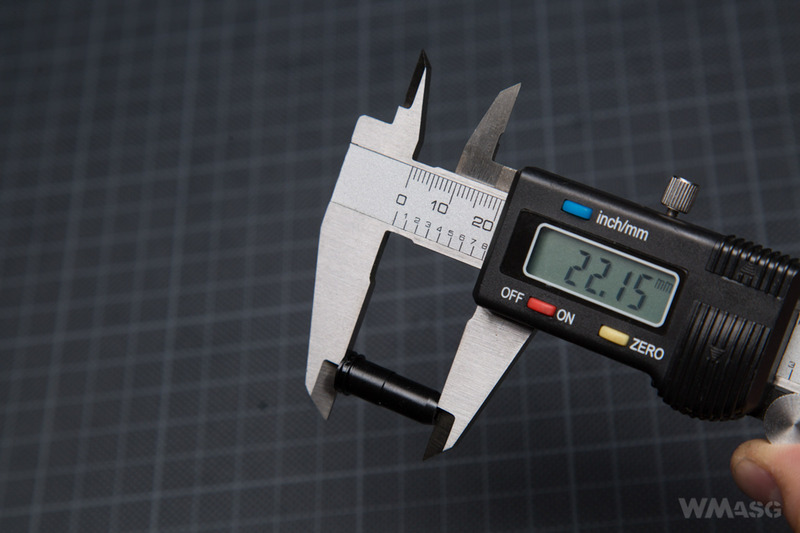 According to the manufacturer's information, it has neodymium magnets. Resistance when turning the gear with one's fingers is noticeable yet low. 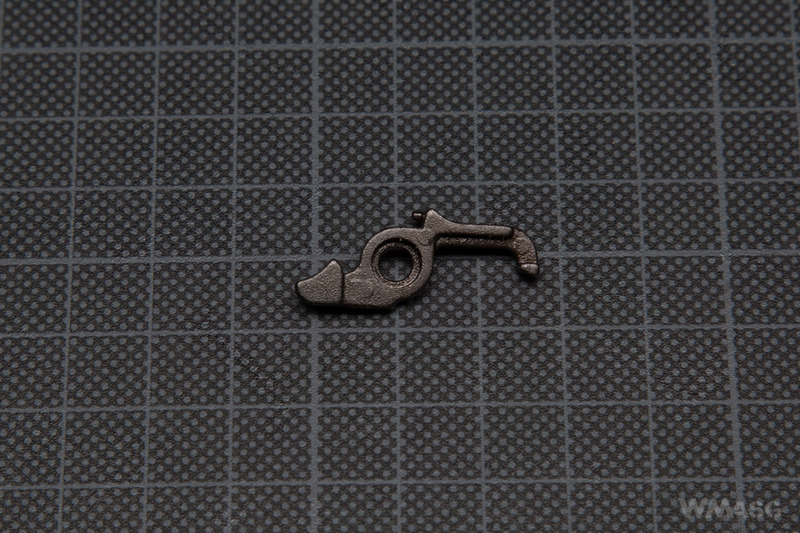 The mechanism, despite very precisely made parts, is assembled with the average care. 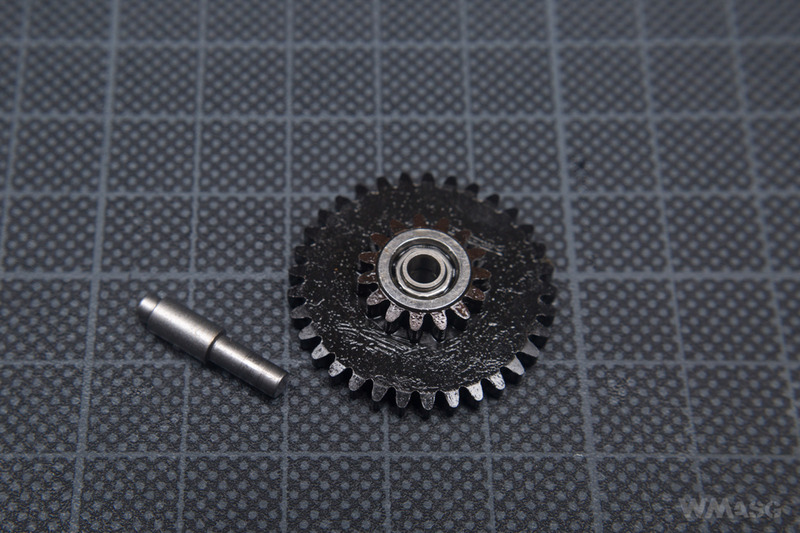 The gears have significant lateral slack. Lubrication is very sparse. A distinctive and, in my opinion, controversial feature is the bolt catch for the dummy bolt which is attached the gearbox. In my opinion, definitely too crafty in design and dimensions - the Seeger ring holding the latch spring in place is less than 3mm in the outer diameter. Its easy to bend or get lost. Its hard to take off. Putting it back on is even harder. 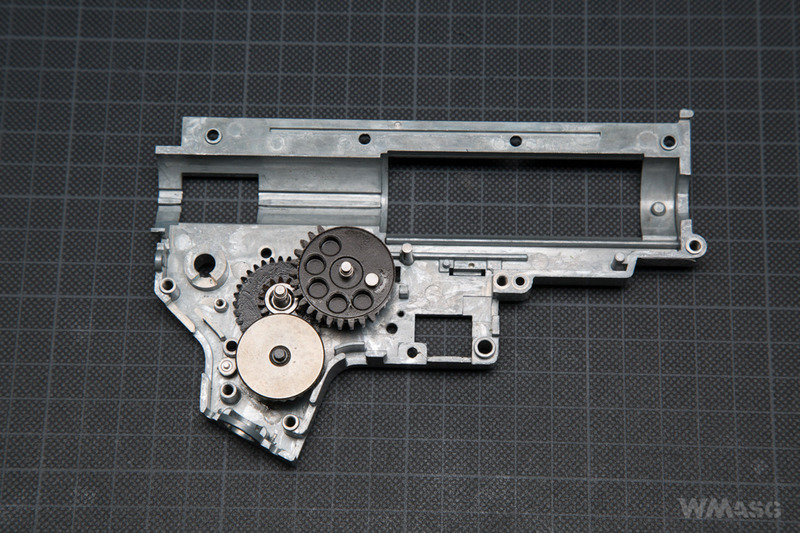 Unfortunately, disassembly of the latch is necessary to open the gearbox. The design of the attachment of the spring that is responsible for the return movement of the dummy bolt is equally delicate. 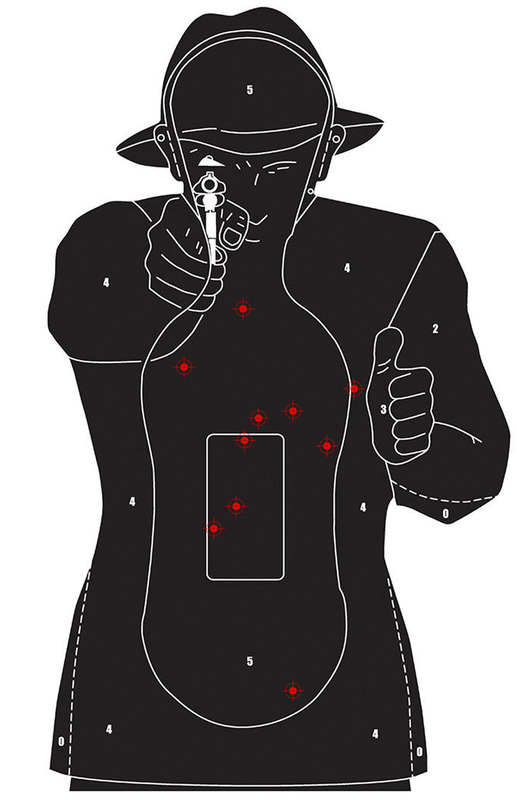 The tests were carried out on our own enclosed shooting range, at a temperature of 28ºC, the Hop-Up was set to zero. The measurements were made with the XCORTECH X3500 chronograph using on 0.2 g BBs. The measured rate of fire (using a LiPo 11,1 V 2400 mAh, 15 C battery) is 18 BBs/s. 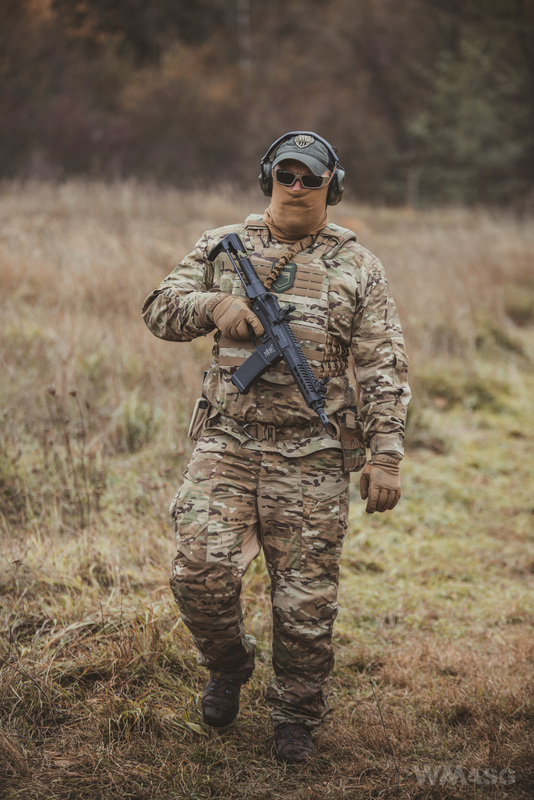 As a reminder, the muzzle velocity declared by the manufacturer is 270 fps. We used biodegradable 0.25 g BBs by Nuprol for this test. The distance from the target was 25 m. The shooting was done from the K-Zone shooting rest. 10 shots were fired from a replica pulled straight out of the box. We did not adjust the sights. All shots hit the target. In my opinion, the XTC PDW is a great looking and well put together replica. From the outside, only the fragile is a con, which quickly scratches and rubs off. Another problem may also be the small amount of space for the battery. 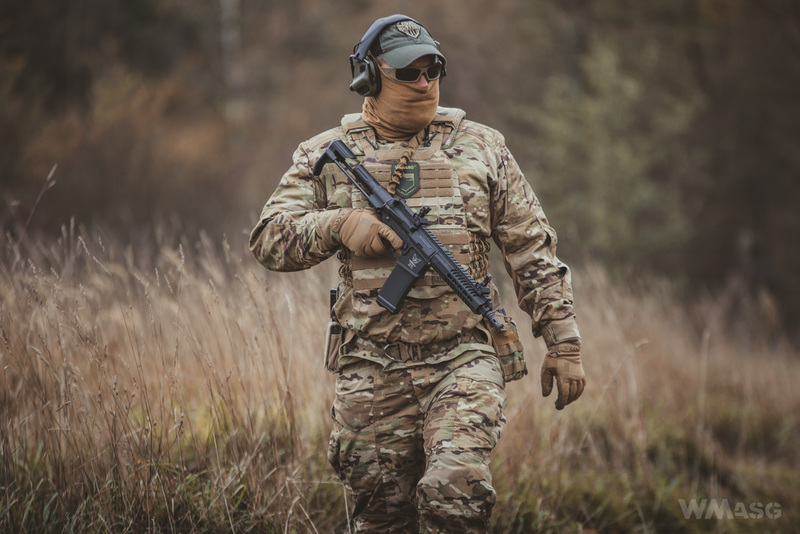 From the point of view of airsoft technology... The replica in several important places abandons the "standard" - a serious problem may be the availability of dedicated spare parts (the gearbox frame, the gears, other small parts). What's more, some solutions are beautiful from the engineering standpoint, but in my opinion, overdesigned and fragile. Moreover, they are completely unnecessary. Therefore, as a replica designed for playing in the factory configuration, or with an exchanged main spring and possibly the motor - its great. 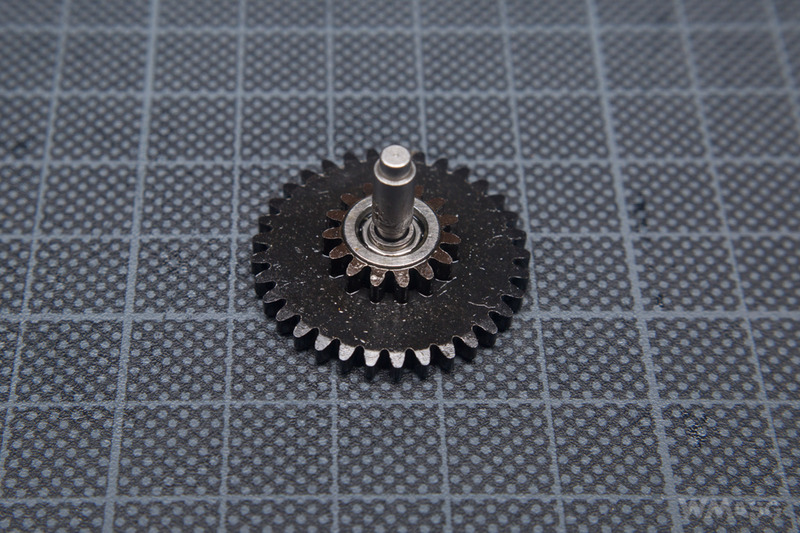 However, due to the non-standard parts, a few unique and fragile solutions, and the annoying and irritating access to the gearbox, I would not consider it as a good base replica for further tuning.